Ben Simmons scores 20 points, 22 rebounds and nine assists as Philadelphia escapes New York, 108-105. Bradley Beal leads the way with 34 points and dishes out five assists as Washington beats Philadelphia. Landry Shamet comes off the bench to score 29 points and grab three rebounds as Philadelphia drops Washington. Rudy Gay scores 21 points to go along with six rebounds as the Spurs get the win over the 76ers, 123-96. Appeared in 62 games (55 starts) for the Denver Nuggets in his seventh NBA season, averaged 13.6 points, 4.7 rebounds, 1.8 assists and 0.7 steals in 31.1 minutes... Registered 25 points and pulled down 10 rebounds vs. MIN on 3/3 … Recorded 20 points on 6-10 shooting from three point range at DET on 2/8 … Posted 24 points 11-19 FG’s in 35 minutes vs. MIL on 2/5 … Tallied a season-high 25 points (8-15 FG’s) and six rebounds vs. IND on 1/25 … Registered 23 points along with four rebounds and four assists vs. CLE on 1/17 … Scored 22 points and grabbed six rebounds at GSW on 1/15 … Recorded 22 points and nine rebounds in 37 minutes at NOP on 12/27 … Posted 19 points (8-15 FG’s) and six boards at LAC on 12/21 … Had 19 points, five rebounds and three assists vs. NOP on 12/15 … Recorded 17 points, seven rebounds and three assists vs. UTA on 12/13 … Posted 17 points (7-10 FG’s) and eight rebounds at WAS on 12/9 … Registered 13 points, eight rebounds and two blocks at CLE on 12/4 … Posted 19 points (6-9 FG, 3-4 3FG), four rebounds and three assists vs. MIN on 11/15 … Registered 12 points (4-7 3FG) and five rebounds vs. LAL on 11/13. 2012-13 (Denver): Appeared in 43 games (eight starts), averaging 13.0 points, 5.1 rebounds, 1.3 assists and 1.05 steals in 25.1 minutes . . . Posted 21 points, six rebounds, four assists and two steals in 25 minutes vs. PHX on 4/17 . . . Scored 21 points (3-5 3FG) in 29 minutes at MIL on 4/15 . . . Had 18 points, nine rebounds and three steals in 34 minutes at DAL on 4/12 . . . Led Denver with 29 points, eight boards, four assists and two steals in 41 minutes vs. SAS on 4/10 . . . Had 21 points and six boards in 30 minutes vs. HOU on 4/6 â€¦ Posted 15 points, five rebounds and three assists in 34 minutes at SAS on 3/27 . . . Had career-high tying 35 points, nine boards, four assists and two steals in 39 minutes at CHI on 3/18 . . . Scored 24 points (9-12 FG) in 25 minutes vs. NYK on 3/13 . . . Tallied career-high tying 35 points (13-19 FG, 6-7 3FG) in 36 minutes vs. OKC on 3/1 . . . Posted 23 points and four rebounds in 25 minutes on vs. LAL on 2/25 . . . Scored 22 points in 28 minutes at WAS on 2/22 . . . Posted season-high 24 points (8-9 FG, 5-5 3FG) in 19 minutes vs. CHI on 2/7 . . . Grabbed season-high 10 boards to go with seven points and two blocks in 21 minutes vs. MIL on 2/5 . . . Registered 20 points to go with six boards and three steals in 24 minutes at HOU on 1/23 . . . Returned after missing past 30 games due to injury to post a season-high 14 points to go with six rebounds and a career-high tying three steals in 21 minutes vs. GSW on 1/13 . . . Missed 35 games due to hip injury, two games due to groin injury and two games due to left shoulder 1st degree AC separation. 2011-12 (Denver): After returning from a stint in China, played in a total of eight games for the Nuggets (6 starts) and tallied 9.4 points, 5.1 rebounds and 2.1 assists in 26.9 minutes . . . Scored six points in 19 minutes at CHA on 3/30 . . . Had 13 points and eight boards in 33 minutes at TOR on 3/28 . . . Tallied seven points, seven boards, four assists, two steals and two blocks in 35 minutes at CHI on 3/26 . . . Posted 12 points, six boards and a season-high five assists at MIN on 3/25 . . . Scored 13 points in 27 minutes at UTA on 3/23 . . . Posted 11 points and 10 boards in 33 minutes vs. DET on 3/21 . . . Had 13 points and four boards in 28 minutes vs. DAL on 3/19 . . . Re-signed as restricted free agent with Denver on 3/18/12 . . . Played in 7 games from 3/19 to 3/30 before playing in only one of the teams final 14 games due to a hip strain. 2010-11 (New York; Denver): Appeared in 72 total games (49 starts), averaging 15.3 points, 5.7 rebounds, 1.7 assists and 1.31 blocks in 33.3 minutes . . . Appeared in 21 games with Denver, averaging 12.5 points, 5.0 rebounds, and 1.6 assists in 30.6 minutes . . . Recorded his highest scoring output as a Nugget in the season finale, with a 27 point performance on 10-20 shooting at Utah . . . Rejected a career-high six blocks in 35 minutes vs. San Antonio on 3/23 . . . Posted 16 points, a career-high-tying three steals (7th time), two assists and two blocks in 29 minutes vs. Charlotte on 3/2 â€¦ Made his Nuggets debut vs. Boston on 2/24, pitching in 16 points (3-4 3FG) and five rebounds â€¦ Acquired from New York on 2/22 as a part of an 13-player trade involving Denver, New York and Minnesota . . . Appeared in 51 games (30 starts) with the Knicks this season, averaging 16.4 ppg, 5.9 rpg and 1.37 bpg . . . Scored 20+ points 17 times and 30+ once as a Knick . . . Recorded five double-doubles with New York, including two of the 20/10 variety . . . Missed three games (1/28-2/11) with a left calf injury . . . Scored a season-high 31 points (13-19 FG) vs. San Antonio on 1/4 â€¦ Totaled 27 points on a season-high five 3FG makes (5-9) vs. Denver on 12/12 . . . Dished out a career-high seven assists to go along with five blocks at Minnesota on 11/12 . . . Recorded 22 points and a season-high 16 rebounds vs. Portland on 10/30/10. 2009-10 (New York): Averaged career-high 15.3 points (third on team), career-high-tying 5.4 rebounds and shot career-high .479 (412-860) over 35.7 minutes in 65 games (64 starts) . . . Season Highs: Points: 35 (2/9 vs. Sacramento); Assists: 6 (1/7 vs. Charlotte); Rebounds: 17 (1/1 at Atlanta) . . . Shot 40-150 (.267) 3FG . . . Led Knicks in scoring seven times, rebounds seven times, assists four times . . . Had 15 20+ scoring games and one 30+ effort (a career-high 35 on 2/9 vs. Kings), with four double-doubles and two 20/10 games . . . Recorded career highs in scoring (15.3), minutes (35.7, 36th in NBA), FG percentage (.479) and FT percentage (.806) . . . Scored a career-high 35 points (15-23 FG) in an overtime loss vs. Sacramento on 2/9, with 23 points coming after halftime . . . Scored 2,000th career point vs. Philadelphia on 1/13 . . . Recorded 24 points and a career-high 17 rebounds in season-high 48 minutes at Atlanta on 1/1 . . . Missed two games due to personal reasons . . . Missed the final 15 games of the season with a sore left groin (Inactive nine times) . . . Underwent left ankle arthroscopy on 4/14 to clean out scar tissue, and underwent surgery to repair a sports hernia on 5/14. 2008-09 (New York): Over 82 games (70 starts), averaged 14.4 points and 5.4 rebounds and shot .432 FG over 33.4 minutes per game . . . Only Knick to play in all 82 games, after playing in just 35 games as a rookie . . . Shot 103-314 (.328) 3FG after going just 9-30 (.300) as a rookie . . . Led Knicks with 75 total blocks, while his 0.91 bpg ranked 34th in NBA . . . Fifth in scoring among NBA second-year players (14.4), sixth among NBA sophomores in rebounding (5.4) . . . Increased scoring average by 7.1 points (from 7.3 to 14.4), tying Philadelphiaâ€™s Thaddeus Young (from 8.2 to 15.3) for the highest increase among all NBA players . . . Led Knicks in scoring 10 times, rebounds three times, assists three times . . . Authored 16 20+ scoring games and two 30+ games . . . Had three double-doubles, all in five-game span from 3/13-3/21/09 . . . Played for victorious Sophomore squad in 2009 T-Mobile Rookie Challenge at NBA All-Star Weekend in Phoenix on 2/13 (six points and seven rebounds in 21 minutes) . . . Paced win at Memphis on 11/12 with 27 points (11-12 FG, 4-4 3FG) . . . Keyed win over defending champion Celtics on 1/4 with 31 points . . . Scored 27 points (11-20 FGA) in career-high 49 minutes in OT loss at L.A. Clippers on 2/11 . . . Season-high 32 points (6-10 3FG) in win vs. Toronto on 2/20 . . . Shot 11-15 FG and 4-4 3FG (26 points) at Chicago on 4/7 . . . Underwent surgery on 6/3 to remove bone spurs from left ankle. 2007-08 (New York): As a rookie over 35 games (16 starts), averaged 7.3 points and shot .438 FG over 19.6 minutes per game . . . Led Knicks in scoring twice, rebounds once . . . Had 11 10+ scoring games (one 20+ game) and one double-double . . . Placed on the Inactive List 21 times . . . DNP-CD 25 times . . . Only game missed due to injury was season finale at Indiana on 4/16 due to a sprained left knee . . . After appearing in just seven of Knicks first 49 games (Nov. 2-Feb. 6), saw action in 28 of campaign's last 33 contests (2/8-4/16/08), responding with 8.3 points and .442 (96-217) FG over 22.6 minutes in those 28 games . . . Started 15 of Knicks final 21 games . . . Scored a season-high 23 points in season-high 44 minutes vs. Orlando on 4/6 . . . Totaled 19 points (8-9 FG) and nine rebounds at Detroit on 4/8, scoring all 19 points in first half. Drafted by the New York Knicks in the first round (23rd overall) of the 2007 NBA Draft . . . Traded from New York to Denver along with Raymond Felton, Danilo Gallinari, Timofey Mozgov, a 2012 second-round draft pick, a 2013 second-round draft pick, a 2014 first-round draft pick and cash considerations in exchange for Carmelo Anthony, Chauncey Billups, Anthony Carter, Renaldo Balkman and Shelden Williams; the Nuggets also received Kosta Koufos from Minnesota in exchange for a 2015 second-round draft pick (2/22/11) . . . Signed contract extension with Denver on 3/18/12. Averaged 12.9 points, 7.1 rebounds and 1.46 blocks over 31.1 minutes in two seasons at DePaul, shooting .445 in starting 52 of his 59 career games . . . 2006 Big East All-Rookie as a freshman, 2007 Second Team All-Big East as a sophomore . . . Unanimous Big East All-Rookie Team pick following freshman year in 2005-06 . . . Averaged 10.6 points, 7.2 rebounds in 25 games (20 starts) . . . Career-high 26 points vs. Seton Hall, Feb. 25, 2006 . . . Career best 16 rebounds at Dayton, Dec. 10, 2005 (highest total for a DePaul freshman since future Knicks teammate Quentin Richardson had 16 vs. St. Louis; Feb. 11, 1999) . . . In sophomore (final) season of 2006-07, averaged 14.6 points, 6.9 rebounds and 1.38 blocks -- all team highs . . . Played over 31.7 minutes in 34 games (32 starts), earning Second Team All-Big East Honors . . . Career-high-tying 26 points in first-round NIT matchup vs. Hofstra, Mar. 14, 2007. 2011 (China): Played for Zhejiang Guangsha in China for the Chinese Basketball Association, averaging 26.6 points and 11.6 rebounds in 32 games. Wilson Jamall Chandler . . . 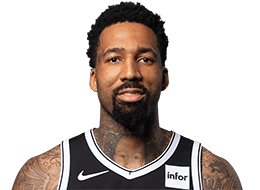 Son of Wilson Chandler and Marie Thomas . . . Proud father of two-year old daughter Jaya . . . Led Benton Harbor (MI) HS to undefeated regular season record as a senior, averaging 24 points, 12 rebounds, five blocks and four steals while shooting .680 . . . Named Michigan's Mr. Basketball in 2005 . . . Four of his dunks in 2006-07 at DePaul were highlighted on ESPN's Top 10 Plays of the Day . . . Credits his grandmother Olivia with most helping him mature as an individual . . . Myriad nicknames include Wil, Ill Wil, Kill at Wil, Wil the Thrill, Willie Blanco and Willie McFly . . . Started playing basketball in fifth grade at Fairplain East Elementary School in Benton Harbor . . . Joined Knicks teammates in day-long effort to deliver more than 300 Thanksgiving meals to NYC locations in 2008.